Carat is a measure of weight, not size. One carat is equal to 200 milligrams. The term is derived from the word ‘carob’. Carob seeds were used as a reference for diamond weight in the ancient world. 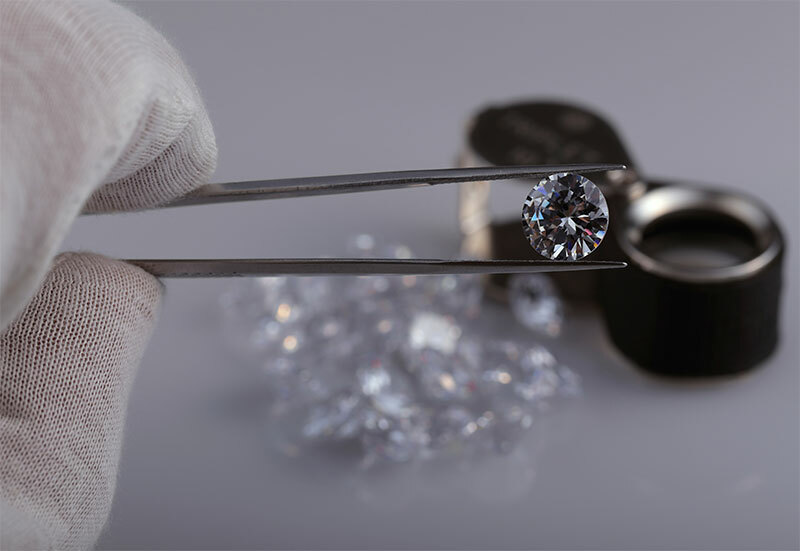 Because larger diamonds are rare, they are more valuable than the equivalent weight in several smaller diamonds. A one carat diamond will generally cost more than two half-carat diamonds, assuming all other qualities are equal. A diamond's cut refers to the quality of the tiny surfaces, or facets. A well-cut diamond reflects light internally from one mirror-like facet to another and disperses it through the top of the gem. The facets, known as the crown, culet, table, girdle and pavilion, are arranged with precise, mathematical proportions to maximise a diamond's fire, life and brilliance. The cut, the only element of the 4Cs influenced by the human hand, is often considered the most important. A diamond that has been well cut may be given a higher quality or value than one that is larger or of a better colour. White or colourless diamonds actually occur in a range of shades – from truly colourless to off-white. They are graded on a colour scale from D (colourless) to Z. The differences between one shade and the next are very subtle, so grading is done under controlled lighting, using a master diamond sample set for comparison and accuracy. Natural diamonds also occur in shades of blue, green, yellow-orange, pink, red and even black. Known as 'coloured fancies', these gems are extremely rare and valuable. They are graded according to the intensity of their colour. Clarity refers to how many ‘inclusions’ there are in a diamond. These inclusions are naturally occurring features – wisps of minerals, uncrystallised carbon, tiny fractures – formed deep within the diamond when it was created. Though usually invisible to the naked eye, they can influence the way light is reflected and refracted. A gemmologist will examine a diamond under 10x magnification before assigning a clarity grade from F (Flawless) to I (Included). The grade may also indicate whether the inclusion is near the centre of the stone or along its girdle, or outer edge.